Greek Mythology Story of Theseus. Hey, why should Heracles be the Hellenic hero? There are plenty of others in mythology, one of whom is perhaps the most Greek of all. Although his antics echo that of Heracles, Theseus was a celebrated champion in his own right. In his home city of Athens were he was particularly regarded as "their own," he was so popular that it was believed that he was based upon two actual figures in Greek legend. He was rumored to have led Athens to victory in the Battle of Marathon. There is sculptural adornment praising his glories in many temples, including that of Hephaestus in Athens. The historian Plutarch—who recorded the lives of the likes of Pericles and Caesar—composed a life of him. Around 470 B.C.E., enormous bones were uncovered on an island (Scyros), and the statesman Cimon declared they were that of the fabled Greek hero. They were shipped to Athens, and a shrine as built as a place of rest. Despite the overwhelming consensus that the remains were of Theseus, it was rather suspect that even if a character of such magnitude had existed, the body could not be that of him. Like Heracles, Theseus was divinely blessed and thought of as an average, even trim, man and not one of such colossal dimensions. The king of Athens, Aegeus, was in a bit of a pickle. There he was, getting pretty darned up there in age, and as royalty, he had no son to prolong his lineage. Desparate to say the least, he journeyed to Delphi and consulted oracle. Per usual, the priestess gave one of her infuriatingly enigmatic answers: on his trek back home, keep his wine skin sprout sealed until he reached the topmost height of Athens. Thoroughly perplexed, he ran the puzzle by his old bud Pittheus, king of Troizen. Well, Pittheus was just as stumped as Aegeus and decided they needed reflect with a bit of wine. As you can imagine, mystery solving soon turned into quite a whoop, and before he could stop himself, Aegeus bedded Pittheus's daughter Aethra. Well, Aethra had quite an evening because the god Poseidon had visited her that same night. Sobered up and unbeknowest that a god had also slept with the princess, Aegeus meekly told Aethra the next morning that if a son were born to their union, she should raise him discreetly and not disclose the name of the father. Aegeus led the girl a rock outside the city, under which he placed his sandals and a sword--a sword that had belonged to the first king of Athens (Cecrops). When the child could recover these items, Aethra was to reveal the paternity and send the youth to Athens to claim his heritage. A child was, of course, born: Theseus. After growing into a trim, athetic young man, he easily lifted the rock and began his quest for destiny. Following the path to Athens, he engaged in a number of adversities. He first encountered the devious Periphetes, a lame man who waylaid travellers and beat them with an enormous club. Theseus shimmied away from attack and eventually killed the crippled man wih his wn club. Next came the evil Sinis who stretched his victims between two pine trees and tore them apart when he released them. Theseus killed Sinis and built a bridge with the wood. Sciron, who had a nasty habit of kicking people and drowning them into the sea, was himself tossed into the sea. At the next stop, the Crommyon sow was ravaging the land; Theseus earned the gratitude of the people by spearing the deadly creature. When he reached Eleusis, he was challeneged by king Cerkyon to a wrestling match, which of course Theseus won, giving Athens sovereignty over the country (the grounds of the match became a celebrated site in Eleusis). Theseus's final challenge was the sinister Procrustes, son of Sinis. Procrustes generously gave weary travellers lodging resting at nights, fitting them into a beautiful custom-fit bed. However, if the visitors were too tall for the bed, he would hack of their feet; conversely, if they were too short, he would stretch them on a rack Theseus used his skill, dexterity and wit to escape this loony's mad scheme, and eventually killed Procrustes. Thus Theseus cleansed the dangerous road to Athens. Now he could concentrate on ucovering his heritage. Theseus was on his way to being reunited with his father. However, in the meantime, Aegeus had married the sorceress Medea. Medea was in refuge from killing the king and Corinth and his daughter [but this story really belongs to Medea and Jason, which I'll delve into at another point]. Medea cast a spell on Aegeus and soon her host married her. So as soon as Theseus arrived in Athens, Medea mystic insight recognized him as a potential rival for her son. Determined to secure Medus's claim as heir to the throne, she refused to disclose Theseus's identity to her husband. In fact, she persuaded Aegeus that Theseus was an opportunistic poseur in pursuit of the throne. Aegeus blindly accepted this fabrication. Medea advised her husband to send the stranger off to capture the Cretan Bull that was ravaging Marathon. This beast was a by-product of Heracles's labors. Theseus, always keen to accept any challenge, accept the formidable task. On his way to Marathon, he assisted the old woman Hecale before proceeding to defeat the bull. The lady offered Theseus a place to rest after the battle, but she died before they reached her home. Theseus honored the kindly soul's memory by establishing the Hecalesian Rites. Medea, perturbed when her stepson returned home victorious, convinced Aegeus that the "stranger" must be deposed of. At the celebration banquet, she laced his goblet with a deathly poison. Aegeus was ready to offer the cup to him when he caught a glimpse the sword at Theseus's side. It was that of Cecrops, and immediately Aegeus realized that the young man was his son. Medea, caught, fled from Athens with her son. Theseus was finally at home with his father. Reunited with his father [or one of them; remember, Poseidon is Father Deux], Theseus learned about a semi-curse that lay over Athens. Annually, seven youths and seven maidens were to be sacrificed to King Minos of Crete. The youngsters were let loose in a labyrinth to eventually be devoured by a horrible creature, the Minotaur. Years before, Minos's son, Androgeus, was murdered in Athens, prompting Crete's leader to wage war. After victory, Minos imposed the yearly tribute as food for the beast. Intrigued and always in search of adventure, Theseus volunteered to be one of the sacrfices. A horrified Aegeus naturally refused and pleaded with his new-found son against it. But a determined Theseus, convinced that the tributes must be stopped, boarded the black-sailed ship to Crete nonetheless, promising his father to change the sails to white if he should return safely and victorious. Minos was at the harbor to greet the ship in Crete and immediate began to bicker with Theseus. Each questioned the other's paternity: Minos invoked Zeus to send thunder and lightning while Theseus boasted the benficiary of Poseidon's protection. "All right then, prove it," challenged the skeptical Minos, and threw a gold ring from his finger into the sea, daring the young man to retireve it. Theseus immediately dove in and was greeted by the Nereid [quasi-mermaids, sans the fish tails]. They led him to Amphitrite, Poseidon's consort, who gave him not only the ring but a crown of Aphrodite. Theseus returned to the surface and gleefully handed the king the prizes. Minos's daughter eldest Ariadne observed this exchange by the shore and fell instantly in love with the youth. Determined to assist Theseus at his hapless task, she explained first that the labyrinth itself was more frightful than the monster because of it was impossible to escape. She gave him a ball of thread to use to find his way out, then further reveal that the beast could only be killed by its own horns. 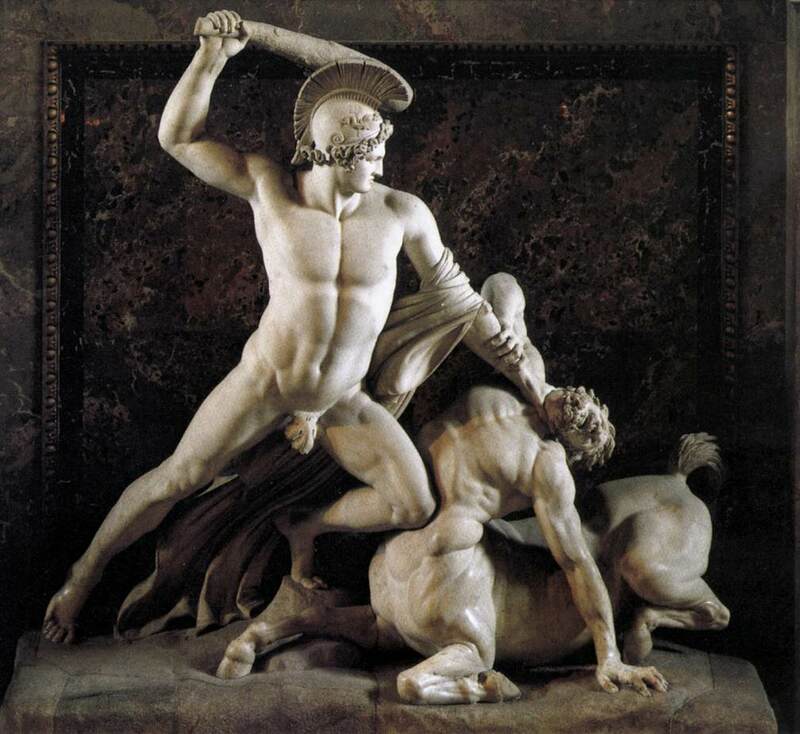 When Theseus encountered the creature, he tore off one and stabbed the Minotaur to death. He raced to save the other youths and maidens, then fled to his ship, which he had waiting for him at the harbour. Accompanied by Ariadne, whom he had promised to marry, the party sailed to Naxos. The group rested, but while Ariadne slept, Theseus abandoned the young girl. As they approached Athens, Aegeus was waiting anxiously at the Acropolis. He peered into the horizan and viewed the ship. Dismayed and distraught and believing his son had perished at the gruesome hands of the Minotaur, he threw himself sea . Theseus had forgotten to switch the sails to white. The body of water where the king had committed suicide became known after Aegeus [the Aegean], and his subsequent death gave Theseus the crown of Athens. Theseus strengthened the position by joining all the neighboring towns under his auspice, and he invited skilled peoples from everywhere to become Athenian citizens. He instituted the Isthmian Games and dedicated them to Poseidon, his protector and co-father. He is even credited in the Fifth Century B.C.E. as the Hellenic founder of democracy. Not only did Theseus improve the everyday lives of his people, but his exploits continued. The Lapith king Pirithous invaded Marathon, but during battle he and Theseus took a liking towards another. The fast friends decided to test their greatness by plotting to kidnap the queen of Hades Persephone for Pirithous and the most beautiful woman in world Helen for Theseus. After successfully kidnapping Helen, the two conniving adventurers descended into the Underworld, they were accosted by Hades himself. Knowing full well what the ne'er-do-well were upscheming, he invited them to sit down. Immediately, the two were bound and destined to remain in the chairs forever. However, Heracles happened to mosey on by in the middle of his Eleventh Labor [capture of Cerberus] and managed to free Theseus. Poor Pirithous, like dear Ariadne, was left abandoned. Theseus rendezvoused with various other important figures during his reign. He particpated in the Calydonian boar hunt along with other heroes of his time. During the Seven Against the Thebes, he forced King Creon to bury the fallen Polynices--death without burial was a major insult in that era. He also sheltered the tormented Oedipus in the latter's twilight years, then, grateful for saving him from Hades, purified Heracles during his bout with madness when he slaughtered his wife and children. His city was also attacked by the Amazons, the race of ruthless women warriors. With great diffculty, Theseus defeated the rival combatants. As a reward, he carried off their queen, Hippolyta. And with Hippolyta as his bride, he started a new family, which included a son, Hippolytus.